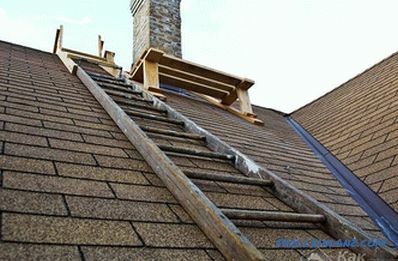 According to the requirements of modern building standards, the roofs of private residential houses and household buildings that have a slope higher than a certain value must be equipped with a special ladder for working on the roof, allowing you to move along it without the risk of loss of balance. The need to use such a ladder is explained by the need to periodically examine the surface of the roofing in order to identify damaged areas that need urgent repairs. and, finally, to protect the roof from damage that could occur when moving directly over the coating itself. The latter circumstance is explained by the fact that some types of roofing are very sensitive to unforeseen operating loads and can be deformed or even partially destroyed by the action of human weight when directly moved along them. Modern membrane or bulk polymeric coatings have these features, as well as bitumen shingles known to many, which may lose their protective properties as a result of partial destruction. 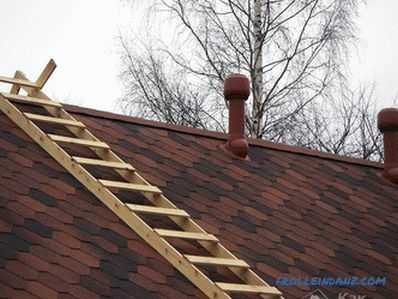 When considering the need for roof ladder equipment, one should also not forget about the high risk of falling from a steep, slippery slope, which is a very real danger to human health. Of course, such an assistive device may well be purchased by you in off-the-shelf form at any specialty store. 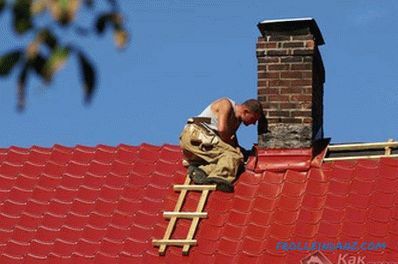 Nevertheless, the discussion of the topic dedicated to the construction of a ladder for the roof with his own hands, causes a certain interest in the user who is used to doing everything on his own. But first, consider the well-known types of ladder structures operated on the slopes of modern roofs. All of these staircase options can be used on various types of roofs with taking into account the characteristics of their placement and mounting on the slopes. 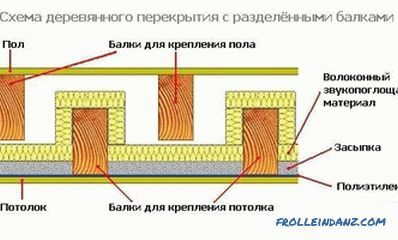 For the manufacture of wooden stairs used a standard set of wood blanks, which includes two supporting rails and several jumpers (the number of which is determined by the total length of the structure). 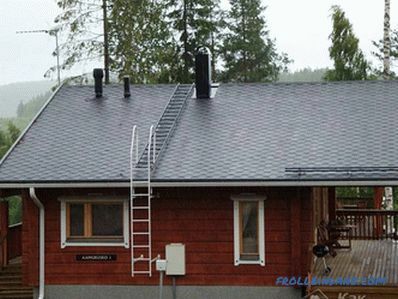 Such ladders, as a rule, are placed directly on the roofing material with fixation in several points of the roof (for example, on a roof made of slate or metal tile, fastening is carried out with the help of special clamps mounted at the bottom of the wave). 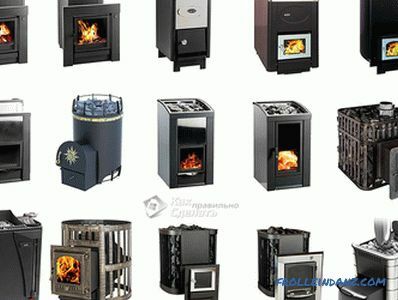 Metal structures, as a rule, are made of steel pipes of suitable diameter or of standard-size aluminum profiles and fixed on the roof with the help of special brackets installed on rubberized gaskets. 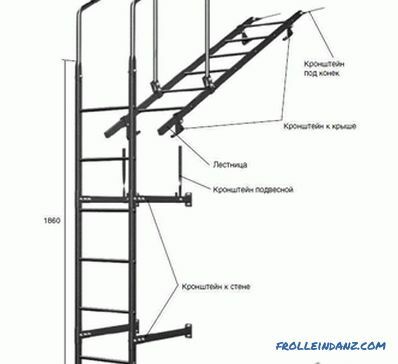 Industrial designs of such ladders are made of galvanized pipes coated with a powder coating on their surface (the color of the protective coating can be any, but most often black, white or brown are used). When self-fabricating the stairs to the roof, this color can be chosen to your taste, that is, individually. Prefabricated metal stair structures are assembled by building from several independent modules without welding . 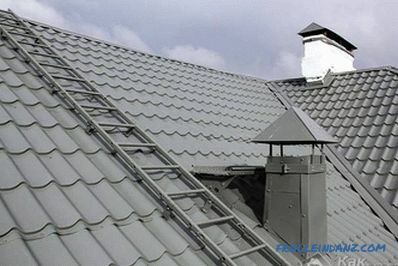 To fix such structures on the roof and its elements, special fasteners or brackets are used, the choice of which is determined by the configuration of the slopes and the type of roofing material. 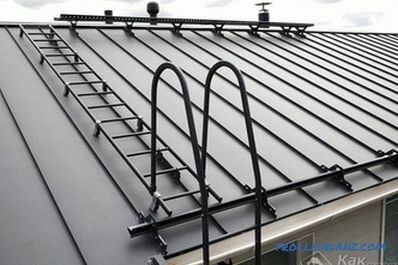 As a rule, from 2 to 10 roofing brackets and 2 ridge brackets are used for fastening the ladder structure on the metal roof. 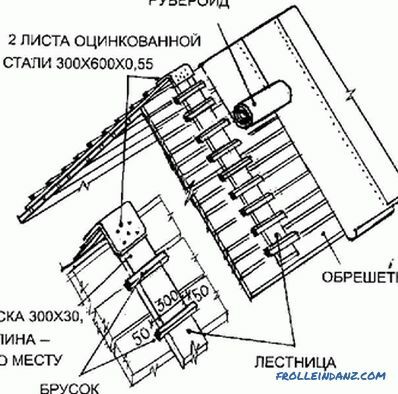 A similar set of fasteners can be used when mounting the ladder on the roof of corrugated flooring with a low profile. Prefabricated metal stairs consist of two parts (wall and roof sections), which allows climbing them directly from the ground. When mounting the wall part of such structures, it should be remembered that the distance from their upper step to the eaves slice should not be more than 10 cm, and the distance from the ladder itself from the wall should be at least 20 cm. The roof section of the prefabricated structure is attached to the wall part with special brackets, elements which pass through the roof covering, which is sealed with moisture-proof rubber gaskets. 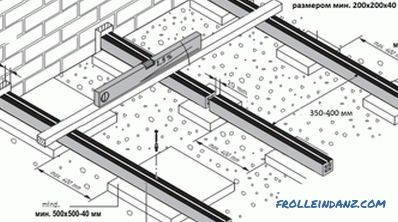 To obtain the required length, the modules of the stairs or its sections are articulated with each other by bolted connections; at the same time the topmost link is fixed on the skate beam. In the place where the wall section of the staircase joins its roofing part, restrictive handrails are made to protect the person from falling. 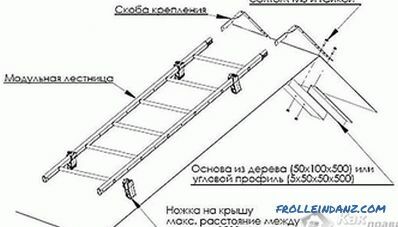 Order self-manufacture of a separate ladder on the roof slope, we consider the example of a wooden structure, as the most simple and cheap in execution. a set of nails at least 100 mm long. The width of the support rails (not less than 160 mm) is chosen taking into account obtaining a distributed load, excluding the possibility of damage to the roof material. 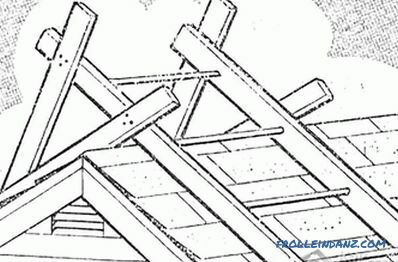 On roofs with a wave-like coating, the distance between the side rails of wood should be chosen multiple of the wavelength, which allows the ladder to be positioned on a hollow. For the manufacture of steps-crossbars, it is more convenient to use squared blanks, since the foot is held better on them than on the boards. Note that it is not necessary to part when choosing the distance between adjacent steps, since this, on the one hand, increases the weight of the finished structure, and on the other hand, reduces the convenience of moving along it. The steps are fastened to the guides with nails per 100 mm, which are necessarily bent from the back side (with the tip hidden in the wood material). In order to be able to fasten the ladder on the ridge - at its upper end it is necessary to provide a special element in the form of an additional thickening of the scraps of the bar. Particular attention should be paid to the reliability of its attachment to the base of the stairs. 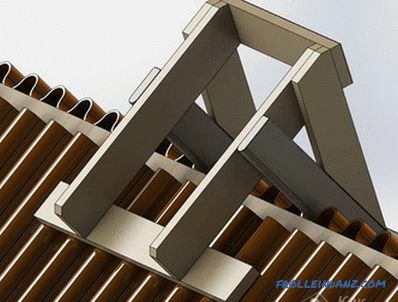 Such an additional fastener can be made of boards of sufficient thickness, which are attached to the base with nails of at least 150-200 mm in size. In order to secure the ladder on the ridge, the hook thickness must be at least 30 cm. Before you make the stairs in the form of a composite metal structure, we recommend that you carry out its preliminary assembly directly on the ground, which will allow you to perform all necessary procedures in safe conditions. In the process of such an assembly, the required length of the future structure is adjusted first (in accordance with the dimensions of the equipped ramp). 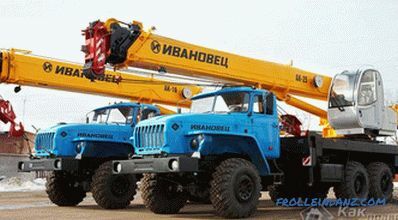 After that, on the basis of the ladder, the elements of its fastening on the ridge are mounted, and the roofing brackets are welded with a pitch of about 2 meters. And only after all these procedures are completed, the finished structure rises to the roof and hooks with the ridge bracket to the upper batten board. 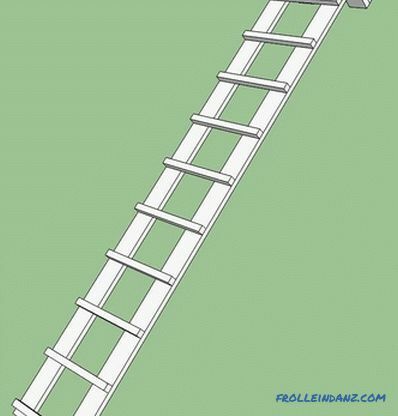 In the same way, i.e., the wall part of the ladder is also assembled on the ground. In the process of assembling, wall supports with a pitch of about 2 meters are mounted on it, as well as restrictive handrails. In addition, additional brackets are welded to the uppermost wall supports, which are used to fasten the structure to the cornice. 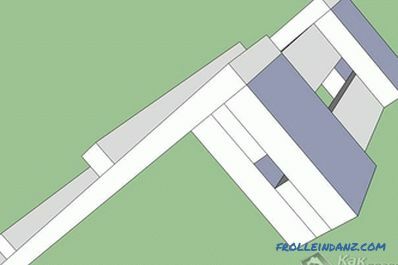 And only after this is the docking of the wall span of the stairs already placed on the roof of the main part (using two connecting brackets). 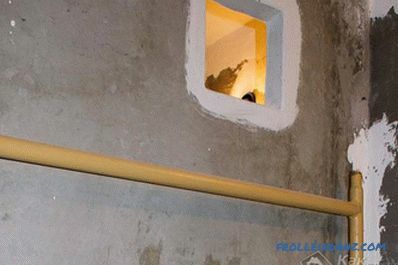 During installation, it is necessary to ensure that its lower step-crossbar is at a height of the order of one meter above the ground, and the upper one is about 10 cm above the level of the cornice. At the final stage of assembly, the brackets pre-installed on the roofing section of the ladder are mounted at pre-designated points of the ramp with the obligatory use of special sealing gaskets.